Ship of Souls is the fourth level of Aqua World in DK: King of Swing. It can be unlocked after completing Lockjaw Falls and Kremling Kamp, and is the final regular level before the boss stage, Davy Bones' Locker. The level is set inside of a haunted, derelict ship. It introduces the new ghost enemy, Powan, who are the only enemies in the level. It also introduces two new objects, including cannons that shoot out moving pegs and pegs that only appear when the Kong holds onto a nearby peg. Donkey Kong exploring the first area, with a cannon firing pegs. At the beginning of the level, a pair of rectangular peg boards can be found above the flat, wooden floor of the ship. A cannon is near them that constantly shoot pegs across the area. The pegs can be used to swing across the room to two square-shaped peg boards. Another cannon is next to them that shoots pegs that can be used to cross the room. 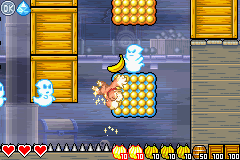 Four bananas float in the air above the flying pegs. Again, there is a pair of peg boards next to a cannon on the other side of the room. The cannon shoots out pegs that can be used to fly across the room and reach another pair of peg boards and a platform that leads to the next area. 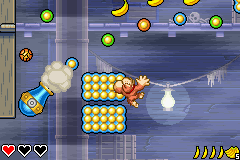 In the second section of the level, there are many Powan enemies that only appear fully when the Kong is not charging his attack. When they are transparent, they cannot hurt him. At the beginning of the area, there are a few of the ghostly foes, along with two rows of three peg boards placed in the air. They are surrounded by crates. A Barrel Cannon is in the corner of the room next to the crates as well. With the cannon and the primate's abilities, the crates can be broken and the hero can continue to a large group of single pegs. Powan foes fly around them. More crates are piled up next to the pegs, blocking the Kong's path. He can progress if they are destroyed, creating a path for him to travel through. Bananas are also scattered along the bottom parts of the area, along with spikes. On the other side of the crates, one can find two more peg boards. The first peg board from the bottom is stationary, but a moving peg board is above it that travels in a vertical path. It can be used to reach a platform that leads to the third area, which is blocked by more crates. Here, the Kong can find a long, blue peg in the air. When grabbed, similar pegs appear all around it for the primate to grab. When he grabs them, some of the previous pegs disappear, and more appear around that peg. Donkey or Diddy must continue up the area with these pegs, while dodging any ghostly enemies on the way. 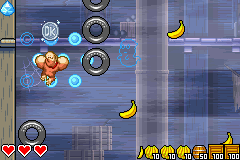 Bananas are scattered from place-to-place in the room, and a trio bouncy tires are near the top of the area, and another is just below. Eventually, one can find a platform with the level exit. The location of the Crystal Coconut. Crystal Coconut Appears inside a box near the top of the second area. Silver Medal At the very top-left corner of the third area.